Barry Allen searches for answers on the Strength Force, and meets a new friend, in The Flash #60, written by Joshua Williamson, with pencils by RafaelJo Sandoval, inks by Jordi Tarragona, and colors by Tomeu Morey and Hi-Fi. Previously, after hitting a low point, Flash and his longtime love, Iris, set out on a quest to learn as much as they could about the Forces (Speed, Strength, Sage, and Still). The idea being that Barry needed to gain a deeper understanding of the Speed Force, instead of just looking at it as a science experiment. On the road, he ran into a pair of villains called Gemini, who can steel Force energy, and are currently hot on his trail. Now, he has encountered a new Strength Force user in Corto Maltese, Fuerza (Force, in Spanish), who is a local hero, in opposition to the corrupt police force. Williamson puts the focus of this issue on Fuerza, and rightfully so. The readers have only seen the young Trickster as a sole Strength Force user before now, and he didn’t exactly have a great understanding of what he could do with the power. Fuerza, on the other hand, has had time to study and master her “gift”, and she can give Barry so many of the answers he has been searching for. 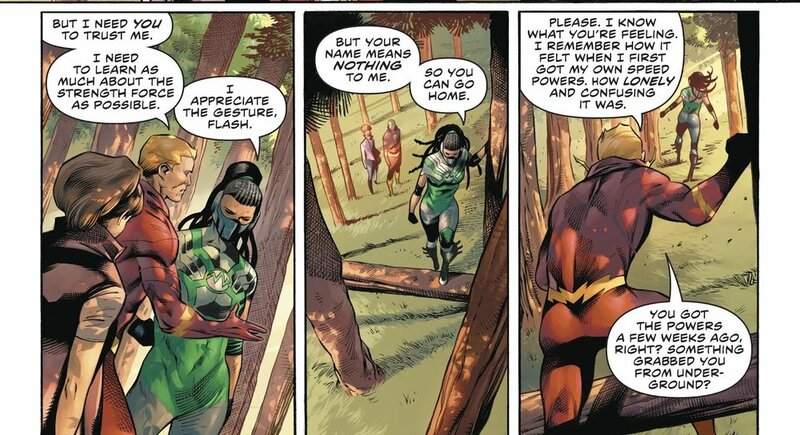 Williamson also introduces the idea that even though she’s a relatively new Force user, Fuerza’s different perspective might give Flash some new insight into how he uses his own Speed Force. Could she hold the keys to Barry unlocking a new level of Speed Force mastery? Only time will tell. Either way, she’s a fun character that will hopefully be popping back up from time to time in the future. Gemini also appears in this issue, and unfortunately, they’re still not doing much. Williamson presents them as being the antagonists of this arc, but despite having Force-draining powers, they have barely come off as little more than a nuisance. It’s hard to imagine Flash having any kind of real trouble with these two, and all they’ve done is follow him around making vague threats about having a plan. If Williamson doesn’t have them make a big move soon, they’ll just end up being a waste of space, and a drag on the story. Sandoval’s art was near-perfect this issue. His characters can look a little static, or posed, in action, but they look so good, you don’t even care. His weak areas are bolstered by the wonderful inks and colors of Tarragona and Morey/Hi-Fi. The Flash is a bright, shiny book, full of lighting and circus-levels of color. If the inkers and colorists aren’t on the same page, the results can be disastrous. Tarragona is great about not going too heavy on the inks, so Morey/Hi-Fi can do their thing. Alternately, Morey/Hi-Fi know when to let the pencils do the work, and when they should be blasting out your eyeballs with lighting. If this team sticks around a while on the book, it’s doubtful there would be many complaints. In the end, despite the main villains not making any major plays at taking down Flash, or stealing a lot of Force energy (or whatever they’re actually supposed to be attempting to do), this was a fun issue that does exactly what this arc set out to do: inform the readers and Barry Allen about the Forces. Fuerza was a great way to dole out that information, and Williamson presented her in a manner that made you want to know more about her. Gemini aren’t really needed in this story, so far, but Williamson is probably taking them somewhere big. If only he’d get there a little faster, because they are the worst part of a very fun story.